SweetStamps BLOG: Blog hopping for a handmade holiday! 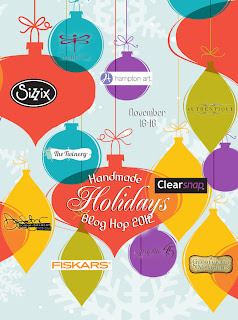 Welcome to the 2nd Annual Handmade Holidays Blog Hop! Calling all crafters! We’ve gathered designers from some of our favorite manufacturers to show you ways to create something from the heart this holiday season. This 3-day Hop includes over 60 stops with inspiration brimming from every corner. Explore all of the thoughtful and frugal handmade gifts you could create for the holidays, all in one place, during our second annual Handmade Holidays Blog Hop! To sweeten the Hop, we’re offering a gift for you! For every comment you leave on the blogs in the Hop, you’ll be entered to win a prize pack from one of the participating manufacturer sponsors! Earn extra entries by following our G&P blog and Facebook Pageand for sharing about the Hop. Become a Follower of this blog, or register for our email updates, like our Facebook Page, and leave us a comment to let us know how you're enjoying this 2nd Annual Handmade Holidays Blog Hop. Linda here, and for my role in the Handmade Hop I created this little mini book and altered tin box to store it in - the perfect little spot to record this year's memories! I started out by measuring the sides, front and back of my tin and cut my Authentique Paper (it's all from the Festive line) to fit. I used a Tombow No.N57 marker from the Grunge set to color the white edges before running all pieces through a Xyron 5" Creative Station. Then all papers are adhered to the tin. A scallop border strip punched from Fiskars Interchangeable Border Punch using Lacy Doubles is attached to the front with Tombow Liquid Glue for a little added color and dimension. A Merry Christmas sticker from the Festive line is used behind the Ornate Plate. A Piccolo Flourish is coated with Glastique Gloss Finish. After drying, I added a coat of Metallic Silver 3D Enamel Gel and let it dry. When it was dry I sponged over it with Mars Black 3D Enamel Gel to achieve an aged look to match the ornate plate - I think it matches perfectly! What do you think? Then I wrapped it with a bit of Maraschino Twine from The Twinery. The poinsettia is also a Piccolo dimensional piece that I brushed with Glastique Gloss Finish and sprinkled the leaves with green glitter and the flower portion with red glitter then added three very small dots of Liquid Glue and sprinkled with the mini gold beads. The book cover utilizes two medallions to add dimension and I added another sticker from the Authentique Festive sticker sheet along with the three little word banners. The inner pages of the mini book are simply created from a couple sheets of cream cardstock cut to 3-inches by 5-inches and decorated with scrap papers and stickers from the Authentique Festive line. Again, all paper edges are finished off with the Tombow marker No. 57 to cover the white edges. I used a piece of chipboard for the front and back covers and covered them with more of the Festive line of papers. The book is bound with the Zutter Bind-it-All and 5/8-inch black wires. If you enjoyed this little gift idea, you'll absolutely love the other projects you'll see on this Hop! Visit the list of blogs below and leave a comment on each by Nov. 27, 2012 at 11:59 PM PST. Each day we will be sharing a brand new list of blogs with brand new projects for you to explore, be inspired by, and create from! the Handmade Holiday Blog Hop! Great prize pack!! Love the project Linda!!!! What a gorgeous project and great prize - Thank you for sharing. Love this project! I'm a big fan of minis and I love that it has a little case too! Love this set! Gorgeous work! Gorgeous projects! I love the mini book! The decorated tin would be great for delivering cookies! Thanks for sharing! So very gorgeous! I recently saw a bunch of these tins at a estate sale. I wish I would have picked up a few. Oh oh oh. I love these ideas. Thank you for sharing. This project is gorgeous. The mini-book with the container would be a perfect gift for documenting a special occasion. Thanks for the inspiration. I am a follower already on FB and I shared too! Fantastic project! !I would love to get this- and it's a gift you could change up and use for other occasions. Thank you!! Very awesome! I love when a mini book has a little matching storage item - so cute! Your projects are beautiful! This is a wonderful hop! beautiful project...great details. love it! Gorgeous Projects!! I LOVE them!! Great prize and adorable project!! Lovely tin and mini album. It would be great for a Dec. Daily! pretty set! who wouldn't like to receive it! I love that tin, and what a wonderful way to makeover a child's lunch box...I absolutely love it. Thank you for sharing! Wow..the lunch box is awesome! I would love to make one of these! I am now following your blog and facebook. I also signed up to follow you on pinterest. You had such cute things on there! What a great idea for your keepsakes. I love it. I'm loving all the ideas on the Handmade Holidays Blog Hop!! Thx!! Combining a mini-album with Festive was inspiring. I love this paper line - created a holiday bird house with it recently. Thanks for sharing your inspiration! Beautiful gift idea! The tin and mini are gorgeous! Fatastic idea . . . totally love it. Beautiful Projects, loving this hop! had never visited this site before, but love the ideas!!! so pretty for the holidays! Thx for the chance to win!! Great project! I'm really enjoying this HOP! Im already a FB liker. Beautiful project and just perfect as a Christmas gift. wonderful altered tin and mini. thank you for sharing them and sponsoring the hop. I want to try making minis so bad and yours are so cute. Great gift idea--love that it fits in the tin. I am enjoying the hop! I love the medallion on the front cover. What a great gift idea! 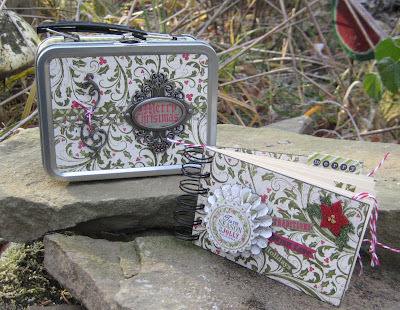 The little lunch box and mini book would be a great gift any time of the year. And with such beautiful paper, looks elegant all year round. I signed up to follow your blog via email, and "like" you on FB. Happy Holidays. This is a beautiful project, thanks for sharing it! I really like this altered tin and mini album -- they would make wonderful gifts! TFS! This is a beautiful mini & tin. Great idea! Beautiful altered tin! I love the mini, best page is the banner one. The mini and tin are really cute and have lots of texture and detail from all the little elements you've used. Love them! Beautiful album & tin - love the colours and dimension!!! ...this idea is a W O W !!... So beautiful..
Great idea! I want to make this!! This is a great idea. I never thought of using the tin as mini album holder. I so love your little decorated tin holder with the little mini album. It is so pretty and such a great idea too. Thanks so much for sharing it. I would love to try this. What beautiful projects! I love Authentique papers and how you used the tin. Love what you did for the Altered Tin box. Very well done. I love the sweet little tin. This is so sweet!All the little details make is visually delightful. I am going to have to try this one for sure! Glorious project with these beautiful papers - all the detailing is just lovely... those embellishments on the front of the album and the tin - wow! wow! your work is AHMAZING! love it! thanks for the chance to win! Love all the gorgeous details on this fabulous project! Your designs are so sparkling! I love them so much. TFS Linda...you are so amazing! I have two of these tins and now I'm finding great things to do with them! TFS! beautiful album and i love the tin - the silver looks fab with these patterned papers. Beautiful projects! Thanks for the inspiring ideas! Wow Lovely project perfect for my niece and granddaughter. Love the lunch box with matching book so KEWL!!! I love this idea-great tin and mini! What a gorgeous little tin and album! I love making albums and have a bunch of tins just waiting to be decorated! 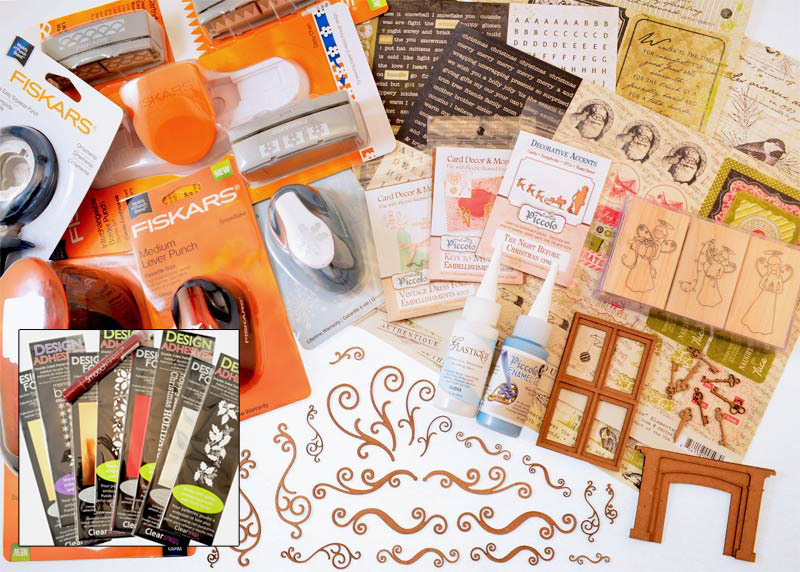 Thanks for the inspiration and for the chance to win this amazing prize package! The colors of this project are wonderful. I have a metal tin that I could use - thanks for the inspiration! Love the look! Thank you everyone for the lovely comments! We're so glad you are all enjoying the Hop and all the creative projects. We appreciate that you dropped by and left us a comment.